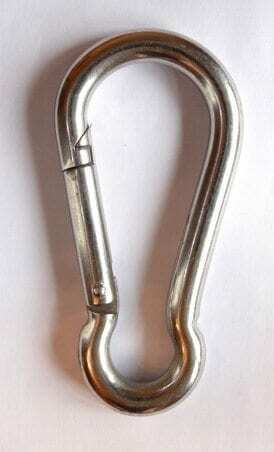 Looking for a strong, great value carbine hook? Whatever you need it for, you’re bound to find it here with Rope Services Direct we have a range of sizes available. Also known as a Carabiner or Karabiner, these stainless steel carbine hooks have a ‘gate’ which is held shut by being pushed against the grove in the hook’s frame. Simple and effective, they are great for use within the construction and leisure industries and other commercial work when staying safe is top priority. Made using top quality stainless steel, they’re great for using internally and externally. Weather-proof and not prone to rusting, they’re versatile enough to be used in sports such as base jumping, bungee jumping, parascending, sailing and many other sports. They’re perfect for use with fibre ropes as well. As well as standard carbine hooks, you can also get locking ones which are extremely similar but have an additional part for protecting the gate. With this screw tightened, the carbine will not open accidentally. At RSD, we specialise in offering an extensive variety of carbines for loads of purposes. Perhaps you are looking to secure it onto a split film rope or braided rope, you are sure to locate the exact carbine hook you require. To make an order, just fill out our quick form. Or if it’s further advice you’re after, simply contact a member of our expert team on 01384 78004. Carbine Hook Overall rating: 5 out of 5 based on 6 reviews.